A musician from the English rock band LOWER THAN ATLANTIS will to help give FREE music lessons at Guildford to celebrate National Learn To Play Day. With National Learn To Play Day coming up soon the ACM [Guildford’s Academy of Contemporary Music] are celebrating early by giving away FREE music lessons on 18th June at their Guildford campus. Sessions will be available to book through local music shop: Andertons. Covering bass, guitar, drums, vocals and new for 2017, studio recording, ACM looks forward to seeing lots of local talent during these classes. 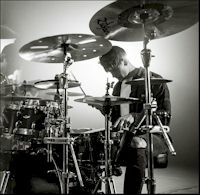 Joining the professional teaching team at ACM on the day will be the Lower Than Atlantis drummer, Eddy Thrower, who’ll be in the studio helping to teach attendees how to record a drum-kit. The Academy of Contemporary Music (ACM) has been leading the way in music education for over 22 years. After recently acquiring the lease for iconic local music venue The Electric Theatre, ACM is firmly committed hosting events for the local community. To book onto a FREE Learn To Play Day session you must be over 12 years old.